Fish Girl Writes: One Year!! Today is the one-year anniversary of my blog's first post! A lot has happened in that year in my personal life and my hobby. I'll take this opportunity to look back on what has happened in the hobby, both in my tanks and around the world. The biggest change for me has been the loss and gain of fish. The biggest loss was that of my two oldest goldfish, Goldeen and Seaking. They both died of separate causes, but it was so close to each other that I can't help but wonder what it was that killed them and whether or not the loss of one was just too much to bear for the other. Goldfish are much more social creatures than most people realize and Goldeen did appear to pine away until he died. The other losses I've suffered have been those of my two oldest bettas. One succumbed to complications from a lymphocystis infection and the other to a failing swim bladder. But I have to remember to smile for the time I had them and know that they helped me learn even more about those wonderful little fish. I have really only added fish to one tank: my community, but in terms of numbers I have added more than I have lost. It's a total of 22 fish added to my community. It may sound like a lot, but these guys are tiny compared to the goldfish and bettas. I have only added one betta: my giant halfmoon plakat. I consider most of my tanks completed in the stocking aspect, so I don't plan to add any more fish for a long while. The other major change has been in the appearance of my tanks; I've added a lot live plants. I had always had things like an anubias or a java fern in some of my tanks, but I never thought I could have a gorgeous planted tank until this past year when some friends convinced to me to give it a try. I've had a lot of success so far, and I've really come to appreciate and enjoy plants even more. All of my tanks have plants that are thriving. I used to just plan what fish I would want in my dream tanks, but now I'm planning the plants for them, too. Another large change is my new-found appreciation for invertebrates. They were once just algae cleaners in my tanks, but now I enjoy watching them so much more. I even set up a tank completely dedicated to them! I haven't even come that far with plants, and I've had plants for much much longer! This change was even more recent than my new love for plants; it has just been since the New Year that discovered how interesting shrimp are to watch. Now, just like plants, every single one of my tanks has some kind of invert in it be they shrimps, snails or both. Just like any hobby based in science and technology, this hobby is always changing. New species are always being discovered and described, and new breakthroughs are made with the technology that support our aquariums. A couple events that stick out in my mind are the describing of the adorable panda loach (Yaoshania pachychilus) and the re-evaluation of the ever so common barb genus Puntius. There were also discoveries like WWF article that detailed the 13 new fish species that have recently come out of the Mekong River delta in Asia. I consider this past year of fishkeeping a year of great growth. I've become more of an advanced fishkeeper and taken my hobby in slightly different direction that others. We each have fish we prefer keeping. Some people love cichlids, some people enjoy guppies and livebearers, and some people enjoy the fish they can breed. I think I've discovered my niche in shoaling fish and shrimps. We all bring something to the table and that's what makes this hobby so interesting. 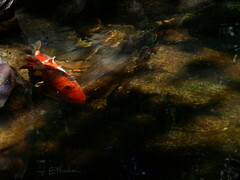 I hope to be able to keep fish for the rest of my life. I am looking at a piece of property to purchase and it has a built in swimming pool on it that has been turned into a Koi pond. Some of these fish are huge. I want to refurbish the pool but I don't want any harm to come to the fish, do you know of anyone in the Chesapeake, Virginia Beach, Virginia area that would be willing to come and assess this pool for me? I don't personally know of anyone nor am I qualified to do it myself. I believe you best course of action is to contact ZNA Potomac which is the koi club for Virginia, Maryland, and DC. They should be able to point you in the direction of a qualified landscaper who will help you get the pond to the condition you want.